George Walker Bush is a traitor. George Walker Bush, the 43rd President of the United States is a traitor. 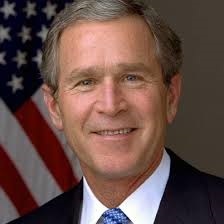 1) George W. Bush admitted to ordering the National Security Agency to conduct electronic surveillance of American civilians without seeking warrants from the Foreign Intelligence Surveillance Court of Review, duly constituted by Congress in 1978, in violation of Title 50 United States Code, Section 1805. 2) George W. Bush intentionally misled the Congress and the public regarding the threat from Iraq in order to justify a war against Iraq, intentionally conspired with others to defraud the United States in connection with the war against Iraq in violation of Title 18 United States Code, Section 371. In the process, it has been calculated by the Center for Public Integrity and the Fund for Independence in Journalism, two non-profit making journalistic watchdog Organizations, that Bush and the members of his regime lied no more than 532 times, “in an orchestrated campaign to effectively galvanise public opinion, and in so doing, take the nation to war based upon false pretexts”. 3) George W. Bush failed to provide US soldiers with bulletproof vests or appropriately armored vehicles. A recent Pentagon study disclosed that proper bulletproof vests would have saved hundreds of lives. Furthermore, as the Downing Street memo revealed, they had no serious plan for the aftermath of the war. President Bush demonstrated a complete disregard for the welfare of the troops and an utter indifference to the need for proper governance of a country after occupation. The result has been a war that has cost U.S. taxpayers at least $757.8 billion with 6,648 U.S. soldiers killed and over 32,000 wounded. 4) George W. Bush conspired to commit the torture of prisoners in violation of the “Federal Torture Act” Title 18 United States Code, Section 113C, the UN Torture Convention and the Geneva Convention, which under Article VI of the Constitution are part of the “supreme Law of the Land. In addition, George W. Bush enters history as the President who did his best to flout constitutional, federal and international law; deride the international community, and created the conditions for the catastrophic economic meltdown which cost the livelihoods of millions of American citizens. The fact that on his farewell speech he could claim that he can look in the mirror and feel great about himself is a telling and revealing statement that here is one callous, arrogant and self-opinionated bigot who served only as the most classic example to highlight all the evils which his enemies had levelled at the United States of America. CLICK HERE to read about his treasonous father George Herbert Walker Bush. CLICK HERE to read about his treasonous grandfather Prescott Sheldon Bush. This entry was posted in Traitors and tagged George Walker Bush, President, Traitors, United States. Bookmark the permalink. ← Eric Himpton Holder, Jr.